The Basics to a PCS! Knowing the basic information to anything is key to later mastering it. And it works the same way when it comes to having a truly successful PCS! So let’s start off *A Month of PCS* with some general questions! Ready. Set. GO! PCS stands for Permanent Change of Station. An even easier way to think of a PCS is simply a Duty Station change. 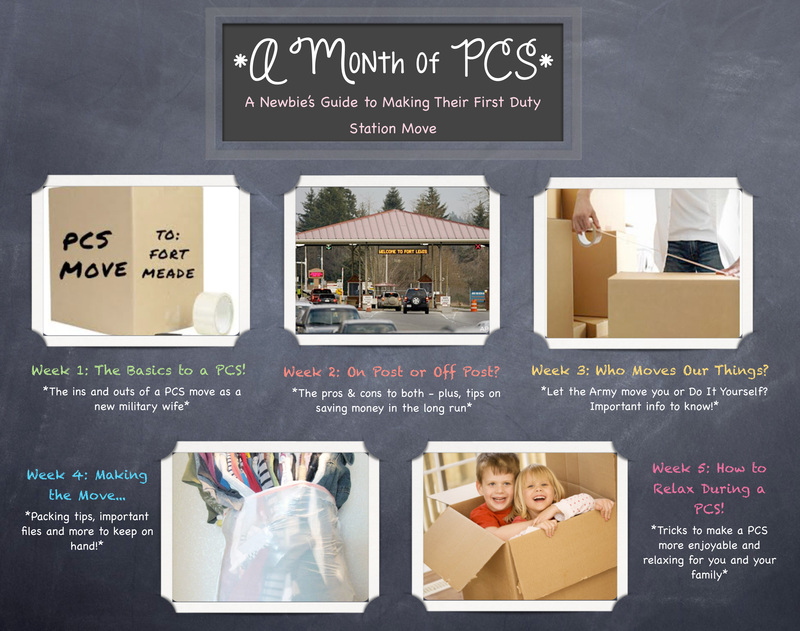 As soon as your spouse receives their official PCS orders to your new duty station, don’t start packing yet! There is still a lot to get organized at the beginning stages and packing will confuse you in the long run! Find your Spouse’s Duty Station Page on Facebook. For instance, Fort Lewis has a Fort Lewis Military Wives Facebook Page. This gave me a great start in figuring out the areas to look at moving to and the areas to stay away from! Be Proactive. Start looking at the different routes you can use when driving to your new duty station. If you have children, consider making a couple of stops at landmarks to make the drive easier! PCSs costs vary. If you’re moving from Florida to Washington, it obviously will cost more than Nevada to Washington. Something to keep in mind is whether you will do a Full DITY (Do-It-Yourself) Move, Partial DITY Move or let the military move you. *I’ll go over these different options during Week 3! Also, another thing to keep in mind during a PCS Move is that you will be spending money out of pocket at first. It’s inevitable So plan ahead. Create a savings account to keep $1000 to $1500 in specifically for PCSs. That should cover any food, gasoline and hotel costs during your move. Don’t worry about losing that money! Once at your new station, your spouse will file paperwork to be reimbursed for any spending. *There are spending limits – so no, that doesn’t mean you get to eat lobster every night during your move! No – Do not be worried at all! And don’t always listen to what you read on the Internet. I’ve found that most spouses that go to the Internet to write opinions usually are bitter over something. So, be and stay positive! Moving can be stressful – you are moving away from family, friends and all of the things you know. Think of this as an adventure, because that’s all life is. Life’s an adventure! As Shakira says on The Voice, “This is a Toughie One.” As a new military spouse, you will most likely run into this situation. And pulling from my experiences and experiences of other newbie Army wives, you will want to try and jump into planning the move right away. This is where you need to slam on your breaks and reconsider all of the info you have. Most likely your spouse was told simply where he or she will be stationed, meaning they don’t have their official orders in hand – Official orders typically aren’t given to the soldier till the final stage of AIT or OSUT. Nothing is 100% certain until you have it typed out, in hand, on the Official orders. If you are applying to On Post housing, most bases will prevent you from applying unless you have your Official Orders sent or faxed to them. As hard as it is, accept that you can only do so much to plan ahead. Do the research of the area, including traffic times on the routes to the base! Look at some neighboring cities or towns by the base. Ask some fellow wives on the base’s Facebook page for spouses on what apartments are great and affordable. Think about what you can do to make life easier for your soldier when he arrives home after his AIT or OSUT graduation. Overall, the basics to a PCS come down to being Proactive. As a new military wife, you have to do some research because your sweetheart most likely isn’t right next to you. And remember to stay on board here at The Real Sweetheart for the upcoming weeks of *A Month of PCS*!